Assalamu Alaikum Warahmatullahi Wabarakatuh, ISGH invites you to an important presentation about Rise of Drugs in Schools. A problem and challenge our youth faces every day. Please spread the word and invite your family and friends to this event. The speaker, Dr. Ahmad Shazad was trained in Medicine in New York City and has worked with patients who have drug/alcohol addiction and mental disorders. He conducted research at Yale University and has deep interest in philosophy, psychology and spirituality. You will have a chance to ask question after the presentation. 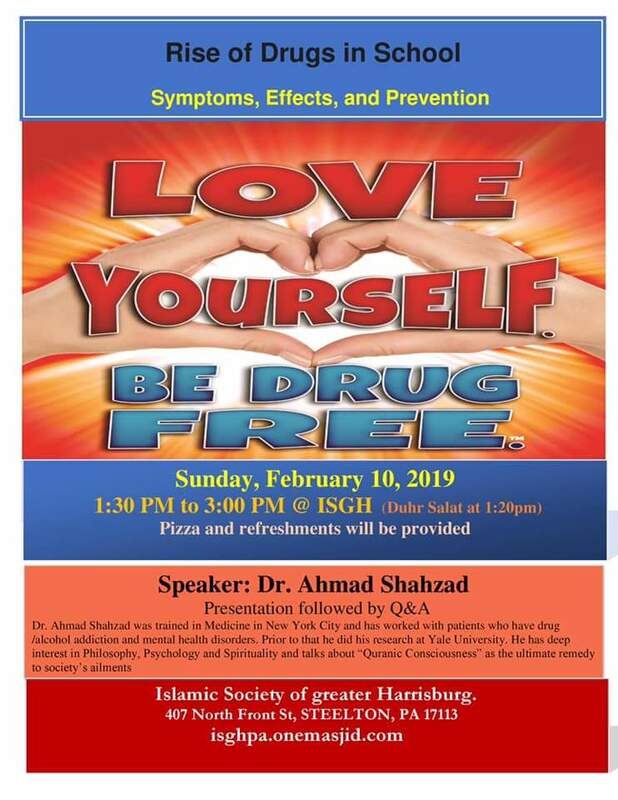 The program will start 1:30 PM at ISGH on Sunday, February 10, 2019.